Christopher Lee, Peter Cushing and Telly Savalas star in this classic and highly enjoyable horror film. German R2 VZ-Handels DVD. The English Professor Alexander Saxton (Christopher Lee) has been exploring in the remote mountains of China, and recovers what he believes to be an ancient fossil, possibly the long saught missing link that would prove evolution. Arriving in Peking to board the Trans-Siberian Express back to Europe, he encounters his old sparring partner, Doctor Wells (Peter Cushing). While at the station, a pick pocket tries to sneak a peek at Saxton's crate, but is soon found dead, his eyes a lifeless white. On board the train, Saxton is very defensive over the contents of his crate, so Wells asks the porter to drill a hole in the box during the night and take a peek, but soon the porter is discovered dead, inside the crate, with the contents gone - moving around somewhere on board the train...! Despite its rather daft sounding premise, Horror Express avoids becoming a typical 'stalk and slash' horror film and instead retains the atmosphere of the classic Hammer horrors. Accordingly, most of the emphasis is on the two British scientists trying to figure out what is going on and how to save the day. The setting aboard the Trans-Siberian Express is very clever, explaining why the train never has to stop at stations en-route, although there are a few noticable plot holes especially at the film's climax. The story generally gels well, with a good balance between humour and some light scares, and enough characterisation to make you care about the fate of the passengers. The film is quite quickly paced, especially compared to most of the traditional gothic horror films, and it certainly never drags, building to a very effective conclusion. Director Eugenio Martín was more at home in the Spaghetti Western genre, but he does a good job from the very start of the film, with an almost avant-guarde opening title sequence, and he maintains a dark and claustrophobic atmosphere aboard the train. The shots of the monster in particular are very well done, keeping it in shadow to retain its mystery but showing enough to keep it interesting. Obviously blessed with a decent budget, the sets and the special effects shots are very effective, although some of the shots of the train betray its model origins. The all important soundtrack, from the American television compser John Cacavas is an electronically enhanced light orchestral score, in keeping with many of the Spanish horror films from the time, and it suits the film perfectly. 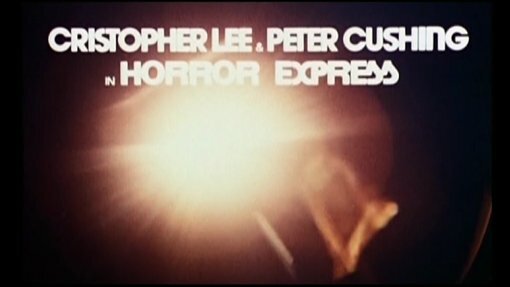 Horror Express is one of the most enjoyable horror films made during the 1960s/70s - boasting that most iconic of genre partnerships, Peter Cushing and Christopher Lee (and making full use of them - not just in cameo roles), and gaining from a well written script and solid production throughout. It comes highly recommended to all fans of gothic horror, Euro-Cult horror and the films of Cushing and Lee. Anyone famous in it? Christopher Lee - The English actor who made his name with Hammer, but worked across Europe. Peter Cushing - Hammer's biggest star who appeared in dozens of their films, including The Mummy (1959). Telly Savalas - An occasional Euro-cult film star who became famous as the American television detective Kojak. Directed by anyone interesting? Eugenio Martin - a little known Spanish director who worked on a variety of Spaghetti Westerns, including the well made Bounty Killer (1966) and the simply weird Requiem for a Gringo (1968). Is it scary? A couple of scenes might raise a scare. Any violence? Some blood and gore, about average for a gothic horror, much lighter than most of the 1970s films. All fans of Euro-cult and Gothic horror will enjoy this, and a must have for any fans of Cushing or Lee. The print is of decent quality, with strong colours - there is frequent light print damage and some artifacting throughout. Colours are generally more realistic than the earlier US Image release. Screencapture comparison between the US Image release (left) and this German disc (right). Audio English and German mono tracks - sound fine, the English track is marginally better quality. Subtitles FORCED SUBTITLE TRACK: With the English audio selected, a forced subtitle track appears saying 'Only for sale in Germany, Switzerland and Austria' - this subtitle cannot be removed on a standard DVD player. Note: This subtitle is below the image, and if you zoom in the film to 16x9 on a widescreen TV, the subtitle track will be cut-off. German trailer (seems to be a newly created trailer). German VHS release opening and closing titles (including a slightly different opening, showing the train going past first, then moving into the title, and an end credit reel, not included in the film print). Still photo gallery - still shots of the film as a video file, presented to some music. Other regions? Various releases in the US, but aside from the OOP Image R1 DVD, all are low quality fullscreen prints. Cuts? Believed to be fully uncut. Print used has English language titles, but Italian onscreen text. One of the most enjoyable Euro-cult horror films, and probably the best Cushing and Lee partnership. Highly recommended. A good looking and sounding release, although the forced subtitles are very annoying. Light on extras. Sadly this is the best DVD currently available. Find our reviews of other films starring Christopher Lee and Peter Cushing. All text in this review written by Timothy Young - 16th August 2007. Part of Horror September 2.